On Nov. 24, in Kermit Davis’ fifth game as head coach, Ole Miss suffered a 14-point loss to the Cincinnati Bearcats in the Emerald Coast Classic, falling to 3-2 on the season. Terence Davis shot 0-for-6, and the Rebels went a combined 3-for-21 from the arc, scoring a season low of 57 points in the loss. It was an overall bad game for Kermit Davis’ team. It seemed as if the Rebels would be destined for a record of around .500 and an NIT berth in the head coach’s debut year. However, the game against Cincinnati proved to be a turning point in the Rebels’ season. After the loss to the Bearcats, Ole Miss went 11-1 in its next 12 contests. The Rebels’ run includes a 10-game winning streak and wins over ranked rivals Mississippi State and Auburn, who came in at No. 22 and No. 16 respectively in this week’s AP poll. Ole Miss came in at No. 18 in last week’s rankings but have since fallen after the home loss to LSU which also snapped the winning streak. Despite the loss, the Rebels were able to stay in the AP poll this week, coming in at No. 20 after a convincing win against Arkansas over the weekend. “We’ve had two top-15 wins, great wins, but that was probably the best win of the year because of the response after you lose your first league game,” Kermit Davis said following the win over Arkansas. 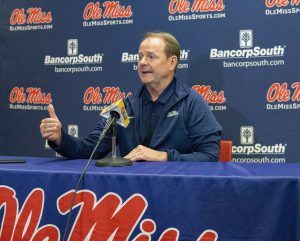 Kermit Davis’ ability to get Ole Miss into the top 25 less than 20 games into his tenure is the sign of an exceptional coach. Ole Miss hasn’t been ranked in the national polls since 2013. Moreover, this season is just the seventh time in school history that basketball has won 14 of its first 17 games in more than 109 years of Ole Miss basketball. Ole Miss has improved dramatically under Kermit Davis. The Rebels rank second in the SEC in field goal percentage at 49.2 and twelfth in rebounding, with more than 30 rebounds per game. Although the team has made major strides as a whole, Breein Tyree has been the biggest beneficiary of Kermit Davis’ arrival. Tyree ranks second in SEC scoring, fourth in playing time, fifth in field goal percentage and ninth in free throw percentage. He has become a more proficient scorer, averaging 17.5 under Kermit Davis, upping his average significantly from his 10.8 average a year ago. Along with becoming a more proficient scorer, he has become a more efficient scorer as well, shooting nearly 50 percent, up from his 39 percent in 2017-18. With Ole Miss now in the thick of SEC competition and vying for an NCAA Tournament berth in March, it will be imperative for Tyree to continue his ascension to the tops of SEC leaderboards. 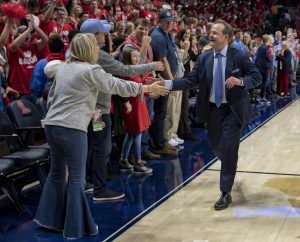 His continued success could be the difference in the Rebels’ ability to reach the NCAA Tournament.